You are here: Home / Desserts / Marshmallow Madness! After you make your first homemade marshmallow, you will NEVER go back to those artificial ones that come in a plastic bag! And after you get your hands on Shauna Sever’s new cookbook all about marshmallows, you might spend endless weeks making marshmallows in all shapes, colors, and flavors! 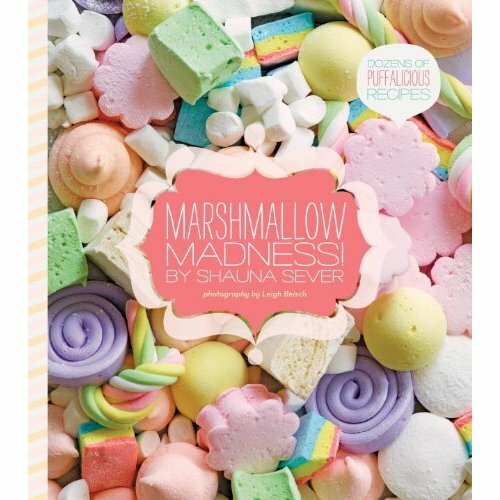 Marshmallow Madness!, recently released on Amazon and bookstores in your city, is by Shauna Sever and printed by Quirk Books; she is best known for her delicious blog “Piece of Cake“. Her approachable personality and simple recipes create confidence in first time bakers. She’ll bring you in with her casual and knowledgeable voice, and take you step by step, in this case, in making the best tasting marshmallows you’ve ever tasted! When I received my review copy of Marshmallow Madness!, my hands started squishing the puffy book. Creatively bound in puffy material and a book cover filled with colorful mallows, it invites you to peruse its pages and find just the right recipe for you. 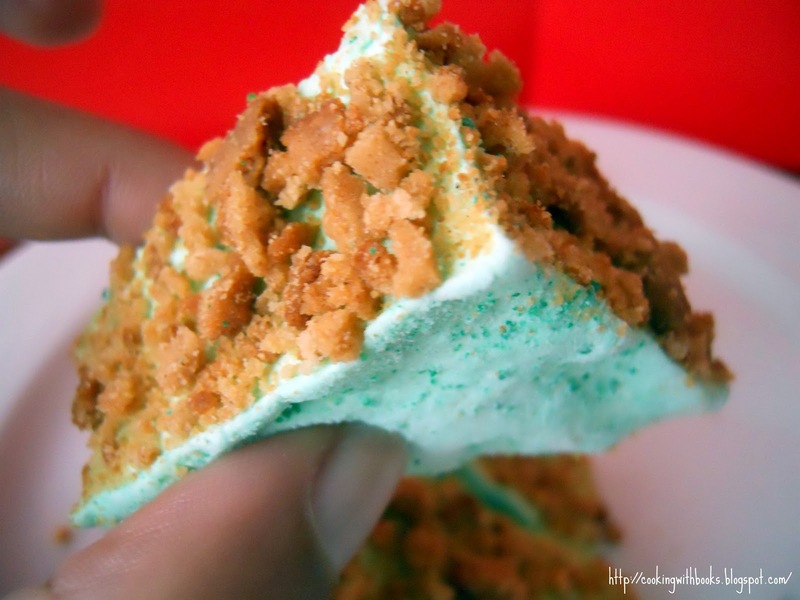 I decided to recreate her Key Lime Pie Marshmallows, light green mallows with bright lime flavor and added crunch with a sprinkling of graham cracker crumbs. A dessert all in itself, these marshmallows are the type of creative genius you’ll find in her book. Other recipes I’ll be trying: Malibu Marshmallows, Maple-Bacon Marshmallows, and her Mango-Chile-Lime Marshmallows! Also, you can check out #marshmadness and see what other bloggers made! Thanks to the generous folks at Quirk Books, today I’m sharing Shauna’s Classic Vanilla Marshmallow recipe, a great starting point for those making marshmallows for the first time. Mastering this recipe will let you experiment with more flavorings by adjusting the extracts you add! But that’s not all! Like I said, Quirk Books are really generous tweeps and are giving away THREE puffy copies of Marshmallow Madness to three Cooking with Books readers. Scroll down to enter! WHEN THE SYRUP reaches 240°F, slowly pour it into the mixer bowl. Increase the speed to medium and beat for 5 minutes. Increase to medium-high and beat for 5 more minutes. Beat on the highest setting for 1 to 2 minutes more and beat in the vanilla; the finished marshmallow will be opaque white, fluffy, and tripled in volume. Pour it into the prepared pan, using an offset spatula to smooth it into the corners. Sift coating evenly and generously over top. Let set for at least 6 hours in a cool, dry place. Variation: Super vanilla-ize these mallows by adding a scraped vanilla bean or dab of pure vanilla bean paste along with the vanilla extract. Disclaimer: Quirk Books sent me a review copy of this book, but I was under no obligation to review or host giveaway. My dream marshmallow flavor is chocolate peanut butter, maybe with Reese’s PB chunks in it. I would love to make pistachio flavored marshmallows. hi i am happy I found your website by accident and I’m going to try out this recipe. I have always wondered how people make marshmallows. but I never had the time to find out instead they would be sticking them on a stick with me out in the desert over campfire. As far as my marshmallow flavor I would like it to be a Tom Yum soup which is my favorite food both hot and spicy and sweet. I love barbecue I don’t think that will do well in the marshmallow flavor. great marshmallow flavor! i love the graham crumble yum! I was just thinking about making some mildly spicy and cinnamon marshmallows to go with hot chocolate. Dream flavor though? How about Bailey’s??? I think you know what flavor I would want to try… LILIKOI! (passionfruit!) That with coconut, or chocolate, or raspberry. Much experimentation to be done! That book looks fabulous! I’m thinking pina colada would be a great flavor! Hmmm I think the perfect flavor for me would be an orange creamsicle. That just sounds so good right now. What a crazy awesome marshmallow!! It must be the sun shining but I’m thinking of lovely exotic fruits local to Malaysia…Lychee and lime marshmallows, or a mango and orange marshmallows coated in toasted coconut (fine) shavings. i totally want to eat one of these marshmallows right now…my dream flavor would be chocolate hazlenut! I am going really mad here…. I love marshmallows. My dream flavor would be strawberry shortcake! My dream marshmallow flavor would be almond (amaretto) marshmallows! I like plain marshmallows the best. Peanut butter and banana flavor. what are the contents of the ‘classic coating’ most recipes call for conf sugar. I have to get myself a sugar thermometer one of these day to make marshmallows. Speaking of favorite flavors, I’ve never tried these but I love the sound of blueberry marshmallows. 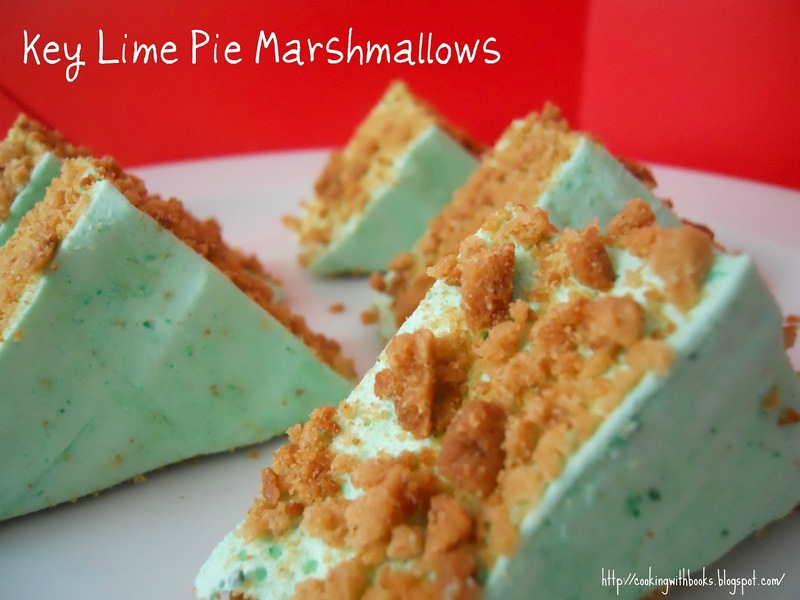 Well, key lime pie sounds mighty fine. But what about black forest marshmallows? Pistachio… Does it sound dreamy? I make caramel pie with a meringue. I’m a big fan of Dulce de Leche ice cream. I love Goetze’s Caramel Creams. Do we see a pattern here? If I could get that in a marshmallow…mmmm, caramel heaven! banana flavor. Like the banana flavor that McDonalds had when they served banana shakes. I think my dream flavor would be caramel amaretto. I have always wanted to try making homemade marshmallows. Just haven’t made it a priority yet. Since I was a kid, I’ve LOVED maple marshmallows. I *never* even considered flavoring them, since I’ve been thinking about (and afraid to) make marshmallows from scratch. Now I’m inspired!! I think a cheesecake flavor marshmallow would be awesome! Everything sounds so yummy!!! I love tropical fruit so maybe some sort of mango and pineapple flavour? Yum! I’d LOVE to win his book, since homemade marshmallows have been on my list to try making since the first time I bought them at WF! Love our Key Like creation, and I’m thinking my dream flavor would be maple pecan. What’s Classic Coating?? E! Classic coating is a mix of cornstarch and powdered sugar. Easier, I just toss them in powdered sugar! Goodness this looks SO fun! My dream flavor would be strawberry. REAL strawberry, not artificial flavoring. Mmmmm. Delicious.